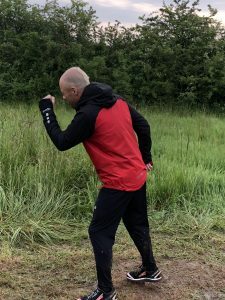 Ian MacKenzie reports: Trail Attack 24 takes place in the Heart of England Forest just outside of Studley, Warwickshire and within twinkling lights at night distance of bustling metropolitan Redditch. It’s actually a few different events over 24hrs, including a kid friendly 3k, daytime 10k and night time 10k. The main event, though, is the full 24hrs – with teams, pairs and solo runners racking up 10k laps against the clock from noon Saturday to noon Sunday. I’d entered this one with my tried and tested ideal team size – having worked out from previous Thunder Run experience that as a solo runner you can choose your own pace, break when you want, eat on the go and adopt the closing stages shuffle without feeling you’re letting team mates down. And as TR24 regulars will tell you, the solo runners get some serious kudos and support. I’d been floating the idea all week that Trail Attack was reachable by train and cab and that, weather permitting, partner Karen and 10yr old Nelly could come kick off the bank holiday weekend by watching dad go through increasing stages of deterioration. The weather wasn’t actually looking that promising but Nelly had a custom ‘Team Ian’ shirt and a new tent had been bought so their minds were made up. Arriving at Trail Attack, it was quickly apparent the ‘timing mats and two tents in a field’ set up was far smaller scale than TR24 and that amongst other drawbacks there’d therefore be no hot food for this vegan family. It’s only fair that I end the TR24 comparisons there – Trail Attack is a more intimate affair and put together by a clearly very dedicated team, many of whom were out on the course themselves all weekend. The smaller field of runners means more time out on your own and puts you in a very different zone than having cross country whizzkid relay teams whipping past all day and night. Pros and cons to that, but it is what it is. Trail Attack squeezes a winding 10k course into an impressively small area – excepting the one climb through a wooded area the entire 10k has been strimmed and flattened through grassland with recently planted trees either side. Clearly marked with orange poles all the way and with two water tables en route, there are some serious switchback sections to cram the route in. Sometimes runners a half mile ahead are only a few metres away behind shrubbery and there’s a frustratingly long loop toward the end that fits a mile onto a postage stamp. Luckily though, being out there for the long haul, there’s no suffering you won’t laugh off eventually. In fact when you pass that point you build yourself back up again and only then can your run begin in earnest. Turning out for my early morning jog, things were markedly different underfoot and sections were now marshland, with no way forward other than to plough on through. Even the coldest water in the shoes becomes a nice warm squish of sorts if you just keep going. The section through the woods was now an off camber mudbath but was manageable by levering myself uphill with a handy fallen branch. Most of the good stuff about Trail Attack came early on for me. The 40mile, 50mile, 12hour and 100k PBs. The deer bounding across the track in front of me. Special mention to the hallucinations (a Porg from The Last Jedi which disappointingly was just a log, but still tricked me every lap). The long squelch after the storm was handled with a resigned detachment. On reflection I think accessing that mindset is a key skill in ultra running. If you stand still long enough on a marathon, the sweeper van eventually picks you up and you’ll be DNF. On a 24, the clock is the sweeper van and finish line combined. Time is all you have. Use it or lose it. There’s a further peculiarity to Trail Attack in how they measure the time. Your time off course is not counted toward your event total. What this meant in practice was me sitting as 3rd place on the leaderboard on 13 laps at about 10.15am, knowing the 4th place guy was still out on his 13th, so my eventual place would come down to whether or not he went out on a 14th – if he didn’t, I didn’t need to as I’d reached 13 first. 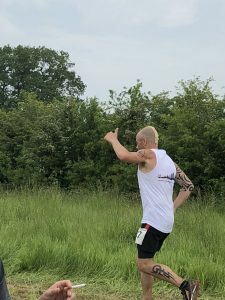 That would be the case at TR24 but not so at Trail Attack – turned out this fellow’s overall pace had been quicker and he’d had a proper kip overnight, so by their rules his 13 scored higher as having taken less time. This scoring approach pulled the rug from under me a bit so off I trudged on a 14th and final lap. The 4th guy quit at 13. Back in the game! A nailbiting finish when with 10 minutes left on the clock the subsequent 4th place bloke could have got back to set out on a 15th lap which I would also have needed to turn in to stay 3rd. Much relief when it turned noon and he hadn’t shown. So there we have it. 24 hour solo racing. A whole different ball game where kit, logistics, nutrition, psychology and philosophy are worth more than running prowess. Would I recommend it? Yes. It’s a great level playing field and those left well behind on fast events may find they’re made of stronger endurance stuff than even their marathon running peers. Would I recommend Trail Attack specifically? Yes, with caveats. It’s a race with its heart in the right place. It’s overall no frills, but it’s local, friendly, cheap and spaces don’t sell out. I think it’s worth a look. This entry was posted in Other races, Race Reports, Ultra by BvH Admin. Bookmark the permalink.